Indian President Pranab Mukherjee inaugurated the Festival of Indian Culture, ‘Namaste Russia,’ in Moscow on Sunday, May 10. Concluding his first visit to Russia as president, Mukherjee said his visit reflected the importance India places on its strategic partnership with Russia. Concluding his four day visit to Moscow the Indian President, Pranab Mukherjee, said he was satisfied with the tour, undertaken primarily to participate in the Victory Day celebrations to commemorate the 70th anniversary of the end of World War II, or the Great Patriotic War, as it is known in Russia. Before his departure, the Indian president said, “By joining the commemorative events related to the War and the terrible human suffering that it caused, India has reiterated its solemn commitment to peace and our resolve to avoid war and conflict. We also re-affirmed our abiding solidarity with Russia on this important and historic occasion which holds deep significance for the Russian people,” he said. “The role played by Russia in defeating the forces of Nazism and Fascism, in particular the heroic contribution of the Russian people, is widely recognized. Though we were yet to win our independence, India played a significant role in World War II. Thousands of our countrymen had paid the ultimate sacrifice while numerous others were wounded or maimed. For India, this was thus an occasion both to commemorate the bravery and indomitable spirit of the Russian people and equally to remember the sacrifices of Indian soldiers in the most defining struggle of the 20th Century,” Mukherjee said. “My visit also reflects the importance that India places on its strategic partnership with Russia. India-Russia relations have stood the test of time,” he reiterated. The President also inaugurated the ‘Namaste Russia’ Festival of Indian Culture in Moscow on Sunday, May 10. Speaking on the occasion, the President said Indian culture and its heritage of art, music and cinema have enjoyed love and appreciation across Russia over centuries. In India too, there is enormous warmth and regard for Russian culture as showcased in its ballet, literature and traditions. “Last year we had hosted the Festival of Russian Culture in India. Cultural interactions have always been a significant aspect of the India-Russia relationship,” he said. Russia’s Gerasim Lebedev, arguably the first European Indologist, pioneered the Bengali theatre 220 years ago in Kolkata, he said. 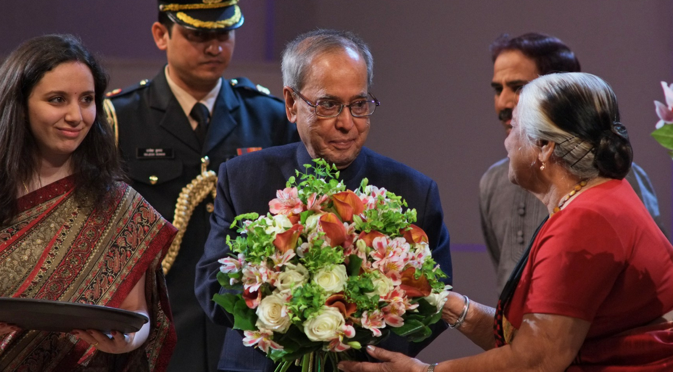 The President announced that the Indian Council of Cultural Relations (ICCR) will institute an annual Distinguished Indologist award to promote Indology abroad. The ICCR will organize a regional conference on Sanskrit and Indology in Russia, while support for the Indian Chair in the Institute of Philosophy of the Russian Academy of Social Sciences will be continued for another two years. With the support of the Russian Ministry of Culture, ‘Namaste Russia’ will reach various regions of Russia over the next six months. In response to the interest in Indian fine arts across Russia, the ICCR will send Indian teachers of music and dance to regional centres in Russia. These efforts will help people living in different regions of Russia to deepen their engagement with contemporary and classical Indian culture. It is also important that the youth of two countries is encouraged to join these cultural exchanges. The President pointed out that the logo for ‘Namaste Russia’ was designed by a young Russian from Krasnoyarsk, who succeeded in an open competition for both Indians and Russians. “Education was a major focus area of my visit…Russia has proven strengths in higher education, especially in the sciences and technical fields. India is seeking to further develop this important sector to serve our national development goals,” Mukherjee said. India and Russia established a Network of Indian and Russian Universities to institutionalize cooperation between universities and institutions of higher learning in the two countries, and seven institution - level MOUs were signed during the visit. Addressing members of the Indian community in Russia, whom the President called “a living link between our two countries,” he exhorted them to continue to strengthen and diversify India-Russia relations.